8998 Toa Mata Nui is a BIONICLE Titans set released in 2009. It is the second set containing a form of Mata Nui. 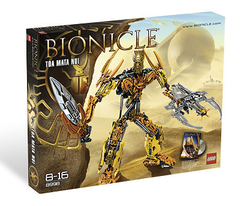 This large version of Mata Nui made up 366 pieces and costs US $49.99. His feet, legs and chest also easily pivots due to "piston" type pieces on his legs and chest. This is a description taken from LEGO.com. Please do not modify it. (see an archive of the product's page) Hero from another world! Exiled from his own universe, Mata Nui must fight to survive on the strange world of Bara Magna. A legendary hero, he is ready to battle for the freedom of the desert villages. This giant-sized version of Mata Nui features a special edition golden Mask of Life, shield, spiky Thornax launcher and the amazing sword he carries in the new BIONICLE movie coming Fall 2009! Features a special edition golden Mask of Life! Armed with a shield, spiky Thornax launcher and an amazing sword! Includes 2 Life Counter for the new BIONICLE battle game! Toa Mata Nui measures 13" (33cm) tall! His hands feature posable fingers. The golden Ignika is exclusive to this set. Facts about "8998 Toa Mata Nui"